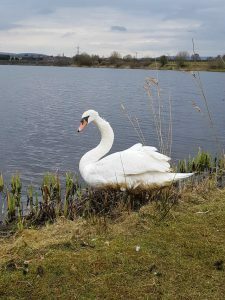 When someone contacted the RSPCA to report an unusual black swan swimming around a lake in Manchester, England, rescuers weren’t quite sure what to expect. They quickly went to check it out — and discovered that the poor swan wasn’t supposed to be black at all. The swan had somehow gotten himself completely covered in thick oil, turning his normally pure white feathers completely black. 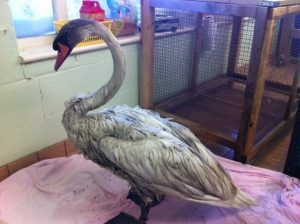 He was so coated that his rescuers were afraid he might have ingested some of the substance as well, and quickly rushed him to the RSPCA’s Stapeley Grange Wildlife Center to get him checked out and begin the process of cleaning him up. 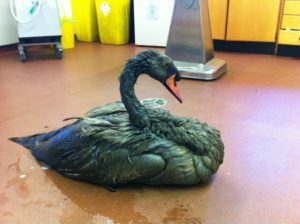 While the rescue center is used for cleaning up animals who are covered in oil, the swan was so coated that they knew it would take several washes before the oil would even start to come off. The thick oil no doubt felt incredibly heavy on the swan’s body, and they washed him as quickly and frequently as they could, working hard to return him to his normal state. “Our first concern was to get the bird washed as quickly as possible, not only to make him more comfortable but to avoid him ingesting any of the toxic material from preening,” Cale said. … and back to his brilliant white color. 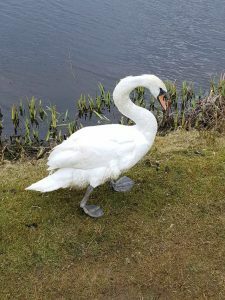 The swan was released back into the wild, and he happily swam away, moving easier and feeling so much better now that he was no longer an accidental black swan.